Amherst MA: Siblings Cinda H. Jones and Evan D. Jones are the ninth generation of the Cowls family to develop what the community needs on their North Amherst land. 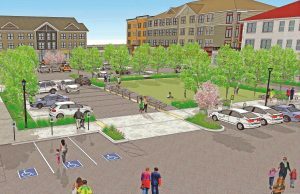 Through the years there was an onion farm, lumber sales, a dairy, a train depot and transfer station, a sawmill and planning mill, lumber drying yards, and, now, there is a burgeoning town center at the Mill District. “Every generation of our family has developed what the community needed at that time,” says Cinda Jones, president of W.D. Cowls Inc.
Members of her family have lived in Western Massachusetts since 1659. The house on Cowls land in North Amherst was built in 1768. With that in mind, she and her brother are spearheading efforts to develop an eats, arts and entertainment district with the help of Mollye A. Lockwood, their vice president of real estate and community development. They are looking to bring businesses, shops and residents to the village of North Amherst. Current anchors include Atkins Farms, Bread and Butter Restaurant, Cowls Building Supply and the Lift Salon. But as they develop the land in North Amherst, the Joneses maintain their family’s concern for land and watershed conservation, focusing conservation efforts in open spaces in outlying areas and development in town near infrastructure and jobs with unmet needs for housing and goods and services. Their father, Paul C. Jones, was their instructor and inspiration. Paul Jones spearheaded the Cowls’ forestry and lumber manufacturing operations and promoted public sportsman access on thousands of acres of timberland throughout his lifetime. The year 2011 marked the 276th year W.D. Cowls had been sustainably managing forests in Western Massachusetts. Also that year, the 3,486-acre Paul C. Jones Working Forest in Leverett and Shutesbury was protected by the largest conservation restriction on private land in Massachusetts. The forest will continue to be owned and managed by W.D. Cowls Inc. and protected in perpetuity by a conservation restriction held by the state Department of Fish and Game. Cinda Jones intends that during the course of this year another 2,000 acres will be conserved in the same area. The next phase of the Mill District in North Amherst is the construction of 130 units of apartments with 22,000 feet of retail space. Plans call for work to begin in August with completion in 2019. Spaces are already being leased. “We’re looking for dynamic shops and services,” Lockwood said. That means it has a pleasing variety of eateries, arts and entertainment. “We want to make this a vibrant, walkable destination,” he said. Lockwood calls Cinda Jones “an amazing visionary,” while her brother says she is passionate and enthusiastic about whatever she does. “She has a lot of energy,” he added. The Mill District is within walking distance of Cherry Hill Golf Course, Mill River recreation area, a library, Puffer’s Pond, recreation trails and a post office. Kim A. Rodrigo, co-owner of the Lift Salon, is proud to be part of what is happening. “I’m super happy about the growth,” she said.